Please install the Unity Web Player to play Country Ride 2 3D! Complete 15 levels full of obstacles and dangerous places. The faster you drive, the more points you get! Go for a ride on the countryside and see if you have what it takes to navigate the windy roads and cross the finish line first. Select your favorite Ford Mustang and put the pedal to the metal in this awesome 3D racing game! Use your keyboard to control the race car! 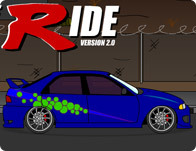 Choose your car and wheels then race over 21 levels as fast as possible. A cool quad bike obstacle course driving game with photo realistic backgrounds. Baloon flying game featuring three different modes, baloon upgrades, and an avatar system. Guide your crazy rocket through the obstacle course using you mouse button to steer. Don't touch any of the obstacles or upper and lower wall or it will be the last think you do.